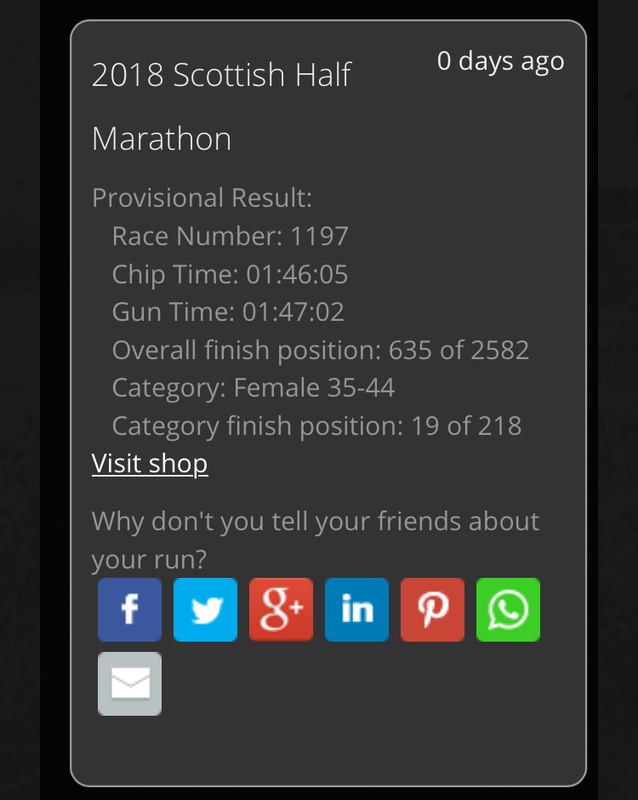 The doms are slowly wearing off after my first attempt at the Scottish Half Marathon on Sunday 23rd September, and what a good event it was. From getting good reminders, and a simple login system with lots of information, to a well organised run, and a good route, I thoroughly enjoyed it. 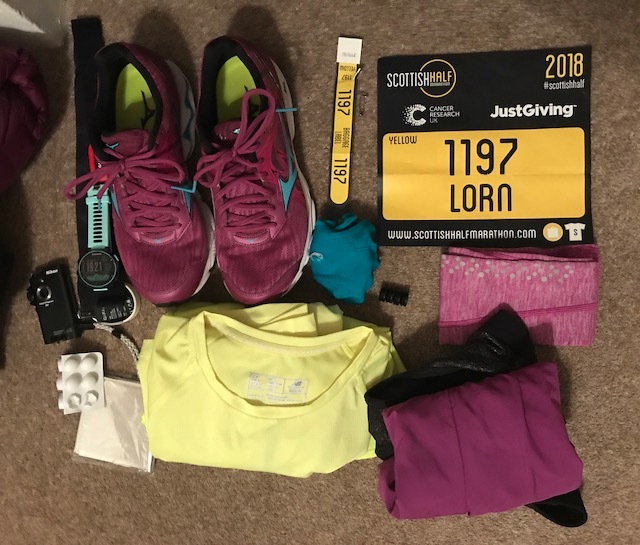 I decided to train for the Scottish Half Marathon this year (instead of the Great Scottish Run in Glasgow, this coming weekend), for a change – to try something different. 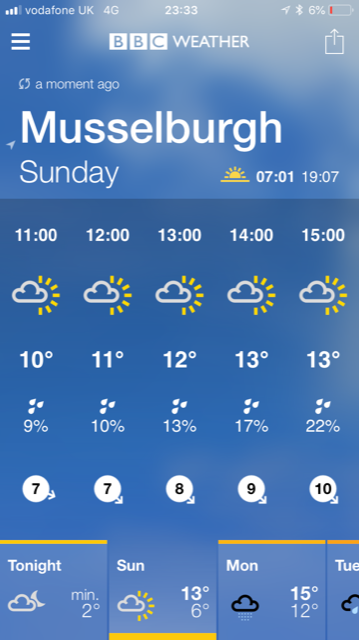 They do a 10k first thing in the morning, then the half marathon from 11am. 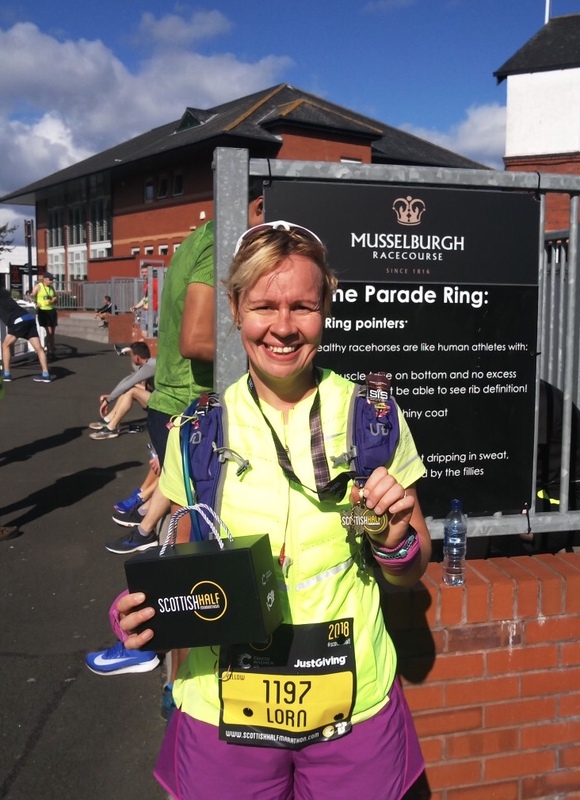 The run was in the east coast – it started in Prestonpans, went more or less 5 miles DOWN to the coast heading east, then went sort of back on itself and west, from mile 5 the remaining 8.1 miles, to finish at Musselburgh race course. I was lucky enough to be staying with some good friends who stay very near the finish line. Robbie was doing the run as well, so we went together to the start line. We got a local bus from just up from their house and got to the start line about 10am. Here’s Robbie and I before we went for the bus. 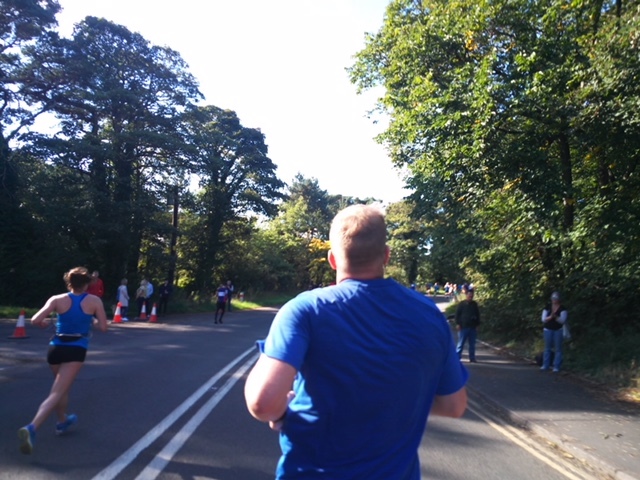 It was Robbie’s first ever half marathon, do it was a good test for him to see if he could do it. 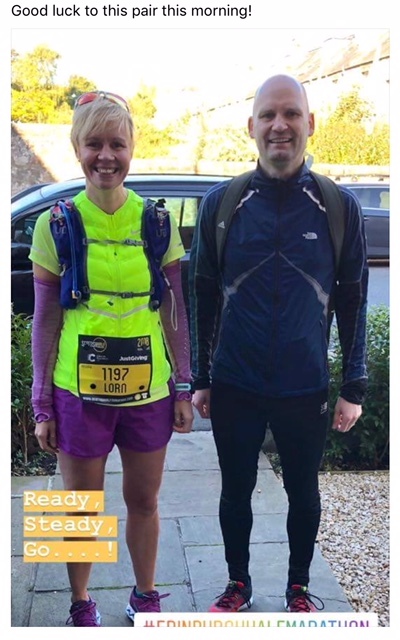 It was nice to share our race day nerves together, and he made me a mean bacon and egg roll for breakfast with black coffee to get me set up for the run. The weather forecast most of the week before had said it was due to rain, then all of a sudden the day turned out beautifully. A little chilly, sunny with big blue skies, no rain and very little wind. Robbie had mentioned that the end of the route (heading west) might be hard if it was windy as you’d be running into the wind off the coast, but lucky for us all, the wind wasn’t too bad, so the route ended up being pretty good. As you can see from the elevation, it seemed to be either downhill or flat! 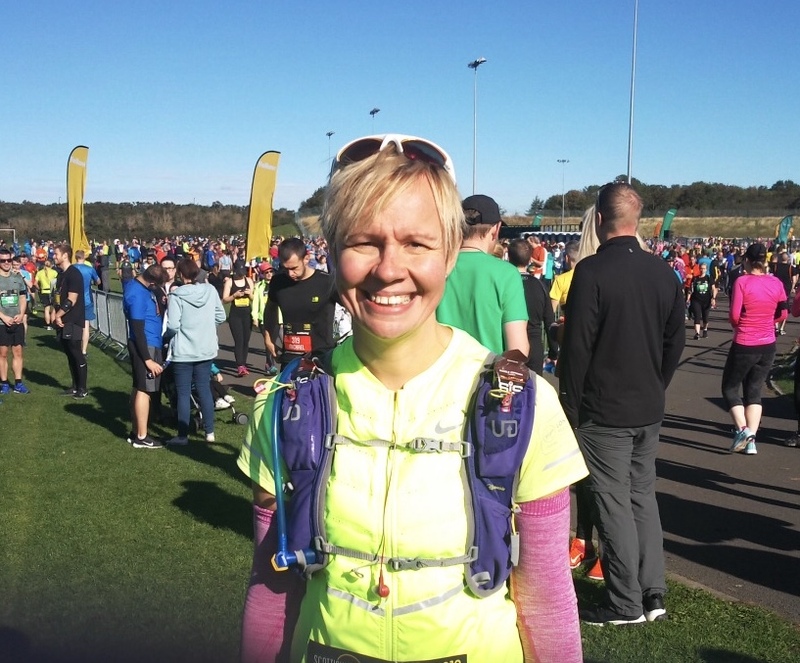 Here’s me at the start… they had a good count down to the start going and everything seemed to be easy to find (baggage trucks / toilets / coloured pens etc). We were both in the yellow pen, which was the second group of runners to head off. I wore my usual purple shorts and yellow top, and I wore my purple arms for some heat at the start. I also wore my yellow gillet (which I probably didn’t need) and my water pack. Robbie had said that his aim was to run at a certain pace (which was faster than me), and we knew we’d run our races separately. We all lined up to start, and before we knew it, we were off. Hundreds of feet tapping away all around me, silence other than that. I’d decided I’d take a caffeine energy gel just before the start, and then another about 5-6 miles in and see how I felt. I ended up just taking on the two, with a total of 225mg of caffeine. I wanted to aim to keep my heart rate steady for around 5-10 miles then see how I felt. I was going to take it easy and see what happened, and I was keeping an eye on my heart rate. It was staying under around 160 for the most part, for about 5 miles. As the miles ticked off I noticed they were mostly under 8 minute miles, and feeling easy. Not like my usual pace, and definitely down hill assisted! I did the first 5k in 24 minutes and the first 5 miles I’m under 40 minutes. The lead runners started passing around the 4 or 5 mile point, and not long after I saw Robbie, running along seeming to enjoy himself. 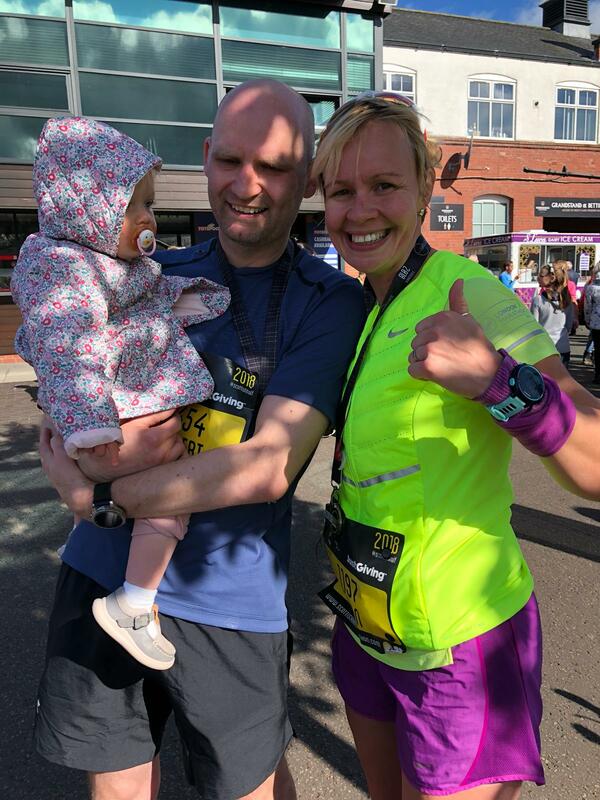 I chatted to a few other runners, complimenting them on running strong, I chatted to a lady who was part of a running club and just back to running after having a baby. And I also got chatting to Suzanne from a local running club, after giving her a shout out for being a local club runner. 🙂 (The endorphins were obviously kicking in by that point). 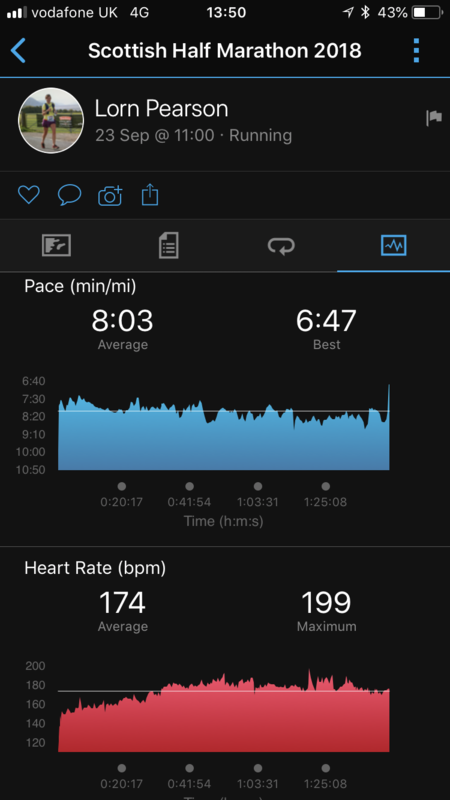 I noticed my heart rate seemed to be going higher after about 5 or 6 miles and I decided to ignore my heart rate from now on and switch my view on my Garmin to pace and average pace instead. 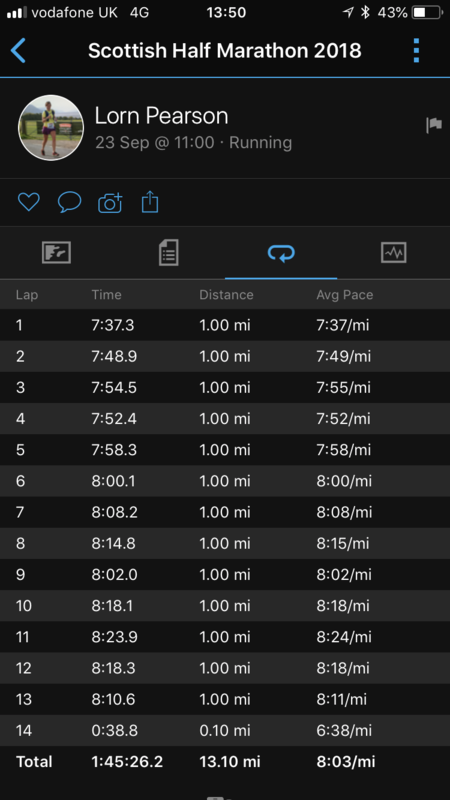 My avg pace was showing at under 8 minutes for most of the run after that, and it creeped just above 8 towards the end. With the downhills almost over with us being next to the coast, the main struggle I felt was the slight wind which seemed to come off the coast. I knew it was very slight, but I decided I’d try to ‘draft’ behind other runners at any opportunity I could. Sticking in close behind this runner, then another, and another … it seemed to help me push it. I did it with this man (but didn’t speak to him), then did it with another man Alastair around mile 8 or 9. He was in a Berlin Marathon 2018 tshirt, so I congratulated him on completing that, and had a good chat with him. Around mile 9 or 10 I ran with a woman with a vegan runner vest, and an Ironman tattoo on her leg. She had headphones on, but I said to her ‘respect for completing an Ironman’ … then we seemed to go back and forth between each other. Then at one point I noticed she seemed to be struggling, so I quietly went in front of her and let her ‘draft’ behind me. I’m not sure if she noticed, but after a while, she must have dropped back. I hope I helped a little. With 3 miles to go, I was feeling ok, keen to be finished but enjoying the journey. I wanted to keep running strong and decided to play a game. I hope this doesn’t sound too cheeky towards men, but I’d mentioned to Robbie that sometimes in Long events, I tend to get to a point nearer the end where I start to catch (usually) men, who have gone out too fast, and end up either waking if slowing dramatically. 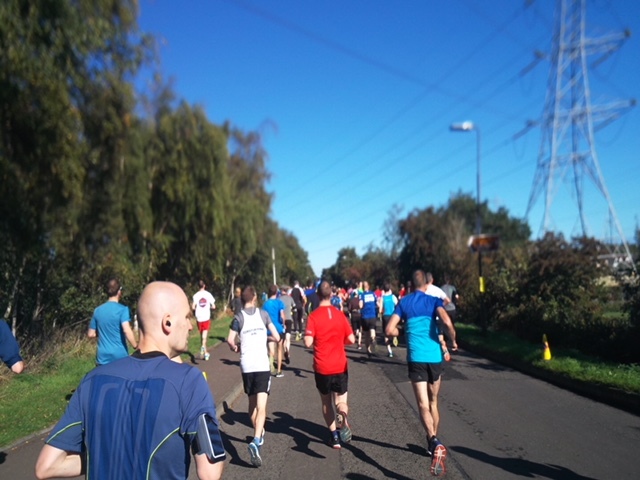 This time I’d clocked two men in particular, who went running really fast past me in the first few miles, and I clocked them – one in a yellow top and one in a red top. I quietly thought to myself, I wonder if I’ll see them later? 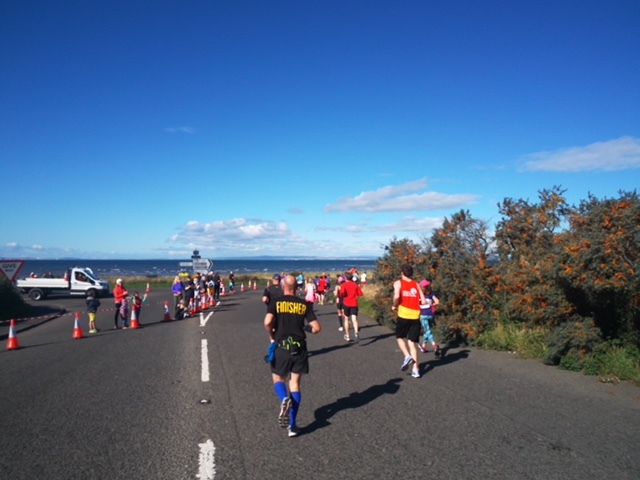 About 11 miles in (my slowest mile), I saw the guy with the yellow top, and ended up over taking him. Then I decided I would start to count the men that I overtook before I crossed the finish line. 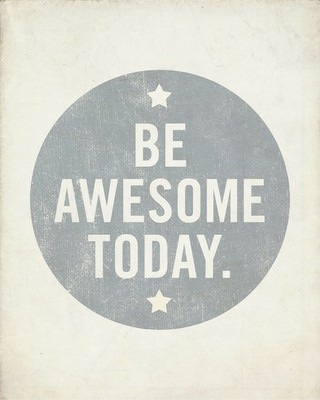 And it fair motivated me to push on. I got the guy in the red too too, and many many more. Lol. (Of course I didn’t count any men who overtook me, that might knock my confidence and effort! )… I just kept pushing on and before I knew it I had overtaken 5 men… 8… 10… four in a go… 14. They were all slowing down, and I was keeping on going. (It felt great). It ended up that 19 men got ‘chicked’ by me… and I had a bit of a sprint off with a man in blue across the line (I think he beat me). For the last two miles I was also counting down the half miles, working out that with a rough outside goal of 1:50 to 2 hours initially, I was probably on for a 1:45 or 1:46 half marathon. My fastest for a while – thanks to those downhills, drafting and chick game. Along the last km I noticed a runner down on the pavement, out for the count and getting first aid. A clear reminder that running half marathons is challenging and shouldn’t be taken lightly. I was glad to be finishing. We finished and we’re funnelled through where the horses went. Walking along, we were given our medals, and the a box with our goodies and tshirts, then an energy bar, and a water. You could choose if you took them or not, so it seemed a good way to share the goodies. Going through to the horses Parade ring of the race course, I suddenly felt like we were a bit like race horses – again probably the endorphins kicking in. Lol. I got Robbie and my friend Siobhan at the end… (and their adorable little daughter). And we all celebrated us finishing and enjoying the event. We were a short walk from the finish to get back to theirs, then I got showered and changed, and got some lunch with them, before heading back home. I finished in 1:45:26 on my Garmin and 1:46:05 chip time. My avg HR was about 174 and max 199. I can’t help but think it was a little out (high), but maybe I was just working hard. 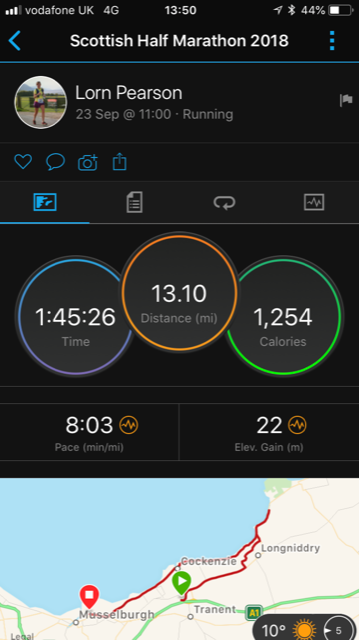 My fastest half for a while anyway, and I still managed to enjoy it. After I got home, we had fish and chips for dinner and I seemed to eat a lot in the whole day, but it all seemed to balance out. 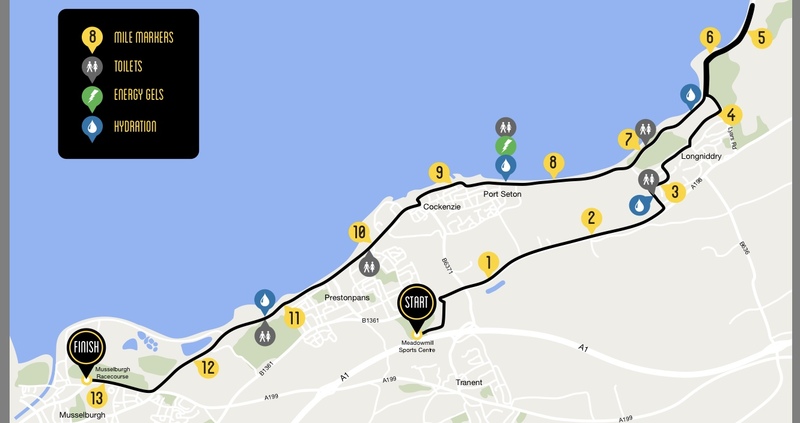 A good event and route and a good wee day it. 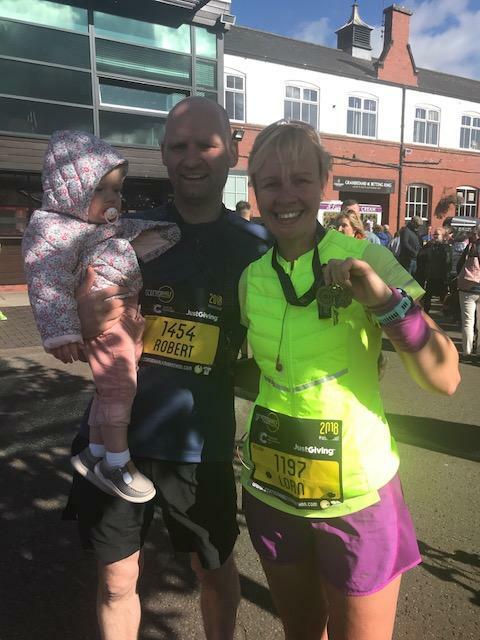 And well done to Robbie on running his first half marathon!